Photo: Bipartisan Bioscience Caucus, BioCT Leaders at their January 30th Joint Press Conference. From left to right: Rep. Jonathan Steinberg (D-136), Rep. Robin Comey (D-102), Senator Tony Hwang (R-28), BioCT President & CEO Dawn Hocevar, CBIA Bioscience Growth Council Exec. Director Paul Pescatello, Senator Christine Cohen (D-12), Dr. Mark Adams of Jackson Labs, Rep. Bill Petit (R-22). 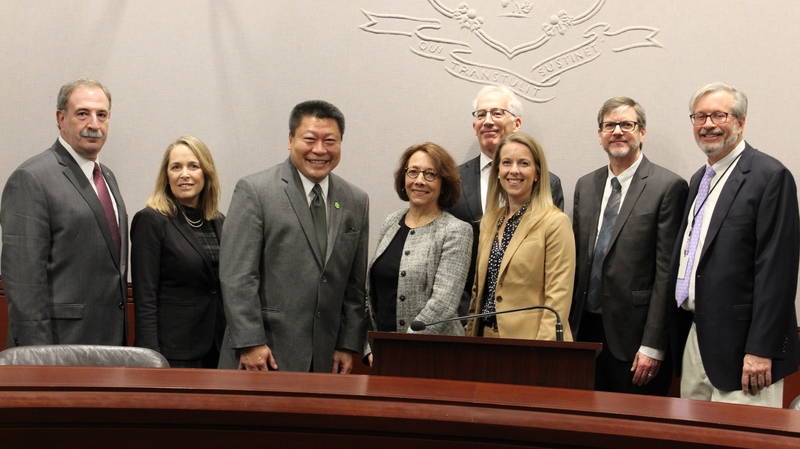 HARTFORD – Earlier this week, the co-Chairs of the Legislature’s Bioscience Caucus met with their main industry counterpart, BioCT, to discuss the strategic plan developed since the last legislative session, and announce specific goals for the coming session. Alongside co-Chairs State Senator Tony Hwang (R-28), State Senator Christine Cohen (D-12), State Rep. Stephen Harding (R-107), and Rep. Jonathan Steinberg (D-136) was BioCT President & CEO Dawn Hocevar and Dr. Mark Adams, Director of Microbial Genomic Services at Jackson Labs. The Bioscience caucus is a group of legislators committed to working with industry partners to create smart policies that encourage growth in one of Connecticut’s strongest business sectors. With some of the world’s leading pharmaceutical, medical device, healthcare, insurance and genomics companies, and several prestigious Colleges and Universities, Connecticut is poised to be a leader in one of the most forward-thinking industries. The Bioscience Caucus is dedicated to ensuring Connecticut takes hold of that opportunity to foster continued innovation and economic growth in the state. The Strategic plan includes five key areas that would make Connecticut the ideal partner for new businesses in the bioscience sector. These include (1) Marketing and Branding, (2) Business Development & Recruitment, (3) Attracting Investment Capital, (4) Infrastructure Improvements, and (5) Workforce Development. Details for each of these key areas can be found in the attached Executive Summary of the CT Bioscience Strategic Plan. BioCT is the bioscience industry voice for the state of Connecticut, and is dedicated to growing the vibrant bioscience ecosystem in Connecticut by supporting innovation, collaboration, networking, education, talent engagement and advocacy. They bring together companies, institutions, entrepreneurs, investors, government, service providers, and others, to create a thriving community to improve patients’ lives and public health.